German chamomile essential oil is a popular ingredient in the cosmetic industry and is used in formulations that are made to improve the condition of irritated, inflamed, or dry skin. The oil is a powerful oil when it comes to treating a number of skin disorders. Besides being used in brewed teas, the German chamomile plant is lauded for its healing properties in herbal treatments and therapies. The German people often call the herb “alles zutraut,” which, when translated, means that it can do almost anything. Sometimes this plant is mistaken for European ginseng because it is known for its ability to cure a large range of health maladies. Another name for German chamomile is Matricaria chamomilla. It is often called true chamomile or blue chamomile and is part of the Compositae family of sunflowers. Both the German chamomile plant and the English or Roman chamomile plant are used medicinally. The German chamomile plant grows in the eastern and southern parts of Europe. The plant can grow as high as almost two feet or 60 centimeters. The plant is well recognized as its stem is furrowed and it conveys tall and heavy branches. The oil is extracted from either steam distillation or by using a solvent. The Roman chamomile plant’s oil is derived using the same two processes. The properties of the oil are derived from a number of well-recognized chemical constituents. The primary components include flavonoids, coumarins, polyacetylenes, and sesquilterpenes. The plant possesses other components such as chamazulene, which has antiseptic abilities. The plant also includes 28 terpenoids and 52 other pharmacological compounds. This mix of compounds gives the oil its fungistatic and antimicrobial capacities. The chamazulene in the plant gives the German chamomile oil a deep blue hue. The color is triggered form matricin when the oil is distilled with steam. If the oil is stored too long or exposed to light, the blue begins to fade. The paler blue can eventually transform into a pale yellow, green, or brown shade. When it is fresh and of a high quality, German chamomile oil is viscous or thick in nature. It also has an herbaceous and sweet scent with a fruity nuance. If the oil is too concentrated or dries out, it can lead to some unpleasant side effects. This oil blends well with essential oils such as lavender essential oil, rose essential oil, neroli oil, cedar oil, or geranium oil. If you want to create a recipe using the oil, the aforementioned oils are recommended. German chamomile essential oil is known for its antispasmodic, carminative, sedative, anti-inflammatory, antifungal, and antiseptic properties. It also is an anticatarrhal oil and helps remove additional mucus from the body. 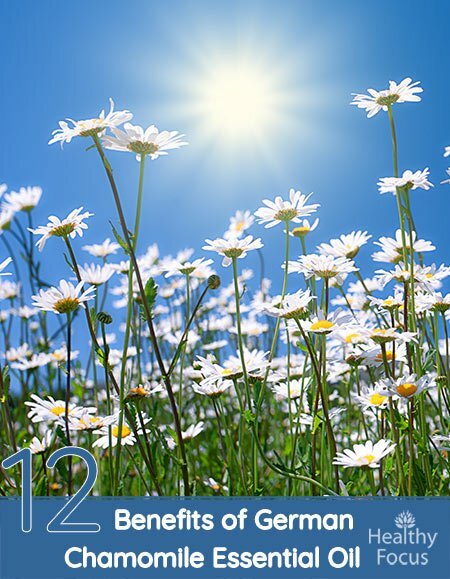 German chamomile essential oil provides the following health-giving benefits. This oil, when topically applied, penetrates into the layers of the skin and provides anti-inflammatory benefits. It restores irritated skin, mouth ulcers, bruises, and other skin conditions. Just about any skin condition can be therapeutically helped when using this essential oil. Use this oil with other essential oils, such as lavender oil, vetiver oil, patchouli oil, spearmint oil, peppermint oil, or rose oil. Studies have also revealed that it can help treat conditions such as atopic dermatitis. One study published in 2010 looked at the effects of German chamomile essential oil on atopic dermatitis in mice and found it to be very effective. According to the researchers it is unclear which component in the oil was effective in treating the condition. This oil is an excellent pain reliever for anyone who suffers from arthritis or who has joint or muscular discomfort. It has excellent anti-inflammatory and pain killing properties that can help relieve both joint and muscle pain. The oil provides amazing relief on its own but is even more effective when combined with another oil like lavender essential oil. Combine your German chamomile essential oil with lavender oil and use topically or add a few drops of the oil to your bath water. Before applying the oil topically, make sure that you dilute it with a suitable carrier oil like coconut, jojoba or sweet almond oil. German chamomile oil strengthens the immune system and is the ideal product to use if you are suffering from the cold or flu. You can also use the oil to minimize allergies or to keep from catching any bacterial infection or virus. Use the oil in a blend for optimum results. The oil mixes well with peppermint oil, rose oil, sandalwood oil, or lavender oil when used for this purpose. More specifically, the oil gets rid of allergic reactions and can be used for treating an inflamed respiratory tract through steam inhalation. The oil can be topically applied to a site by applying a couple drops of the oil with a dampened cloth. Place it on the area, making sure that the essential oil faces away from the skin. The oil will seep through the cloth and assist in healing the wound. This is the best way to apply the oil, especially if a user suffers from hypersensitivity. Because of its powerful antibacterial properties, German chamomile essential oil may help clear up a number of anogenital conditions such as genital warts. Many women suffer from extremely painful cramps during their monthly periods. Fortunately, there are a number of excellent home remedies that can help alleviate these painful symptoms. German chamomile essential oil has natural analgesic and anti-spasmodic properties that can help ease cramping and soothe the pain. You can use German chamomile essential oil to relieve the pain of menstrual cramping in several ways. Try diluting your essential oil with a suitable carrier oil and massaging it into your back lower back and abdomen. Alternatively, add a few drops of German chamomile essential oil to your bathtub and let the healing goodness wash over you. For even greater relief, combine a few drops of the oil with another analgesic essential oil like ginger, peppermint or lavender. Use the oil to relieve the itching of a candida infection by taking a warm sitz bath. Add a drop of the oil and a couple drops of tea tree oil to the bath water for optimum relief. Take this type of bath until the problem is resolved. Studies have revealed that inhaling a steam containing chamomile extract was helpful in treating the symptoms of the common cold. (3) The best way to treat colds and congestion is to make your own steam inhalation treatment. Add a few drops of your chamomile essential oil to a sink full of hot water. Cover your neck and shoulders in a towel and inhale the soothing vapors for three or four minutes. You can use the oil in a poultice to treat shingles. Combine 10 drops of the oil along with four drops of bergamot oil, two drops of geranium oil, and five drops of lavender. Mix the ingredients for use as a compress with either 1.75 fluid oz. of sweet almond oil or with water and apply in the form of a poultice to help ease the symptoms. German chamomile essential oil may also help relieve headaches and migraines. Simply add a few drops of your essential oil to a moist towel or cloth and apply the cloth to your forehead whenever you have a headache. As well as being good for the skin, German chamomile essential oil is also very good for your hair and scalp. To moisturize your hair, combine two drops each of German chamomile oil, lavender oil and rosemary oil with four tablespoons of coconut or sweet almond oil. massage the mixture into your scalp and hair twice a week and leave on overnight for the best results. There are a number of different ways to use German chamomile essential oil depending on the condition you are trying to treat. You can apply German chamomile essential oil topically to treat your skin or ease your joint and muscle pain. However, you should be sure to dilute the oil with a suitable carrier oil or with your regular skin care products before applying it to your skin. To treat stress or insomnia, try diffusing the oil at home or throughout the day and night. Inhaling the oil directly from the bottle as and when needed can also help calm your nerves. For congestion and colds, try making a steam treatment following the method we described earlier in the article. You can also add a few drops of chamomile essential oil to your bath to treat genital conditions or to ease painful muscles. What is chamomile essential oil used for? Roman chamomile essential oil is a traditional remedy with a number of modern applications. It is used to help treat a range of inflammatory skin conditions like eczema and dermatitis. It is also used to relieve muscle and joint pain, clear up cold symptoms and boost the immune system. Roman chamomile essential oil also has mild sedative effects and may help ease feelings of stress and combat insomnia. Is chamomile oil good for skin? Yes it is. Roman chamomile essential oil has anti-inflammatory, antiseptic, and antimicrobial properties. It is also rich in antioxidants. Applying the oil to your skin can help treat a variety of inflammatory skin conditions while it can also help maintain the general health and appearance of your skin. Why is German chamomile essential oil blue? German chamomile essential oil contains a compound called azulene which is responsible for its blue color. What blends well with German chamomile? German chamomile essential oil blends with a wide variety of other essential oils especially floral and citrus oils. . It blends especially well with bergamot, clary sage, lavender, ylang ylang, geranium, marjoram and neroli essential oil. German chamomile oil comes with some precautions. These plants were treated with Agent Orange in certain areas of the world during the Vietnam conflict. Residues of the substance can be found on certain German chamomile plants. Source the product from a company that uses organic materials when manufacturing essential oils. The oil contains coumarins constituents which makes it potentially unsafe for anyone using anticoagulant medications or a blood thinner such as warfarin. Consult with your doctor if you are a heart patient or are taking a blood thinner. This herbal oil may not be for you. Pregnant women should never take German chamomile oil as it can induce labor because it can produce emmenagogue effects. While the oil is not known to cause allergic reactions or problems with hypersensitivity, it still might not be a good idea if you are allergic to any plant in the Compositae or Asteraceae family of plants. To check if you may have a reaction topically, conduct a skin patch test first. Apply a drop of the oil to the skin and wait for a couple hours. If you notice any irritation, discontinue use of the oil immediately. German chamomile essential oil is a wonderful oil with a diverse range of uses. Although many people associate chamomile with stress relief, it has far more uses besides. It is an excellent, natural remedy for a range of inflammatory skin conditions as well as for general skin and hair care. German chamomile essential oil also has all the properties to help soothe aching muscles, painful joints, headaches and menstrual pain. Not only that, but German chamomile oil has excellent antimicrobial and antiseptic properties that can help treat a range of infections and help wounds to heal faster. Have you ever used German chamomile essential oil and what did you us it for? Please let us know what you thought of its effects. We would be very happy to hear your thoughts. (3) Saller R, Beschomer M, Hellenbrecht D. Dose dependency of symptomatic relief of complaints by chamomile steam inhalation in patients with common cold. Eur J Pharmacol. 1990;183:728–729.